Nothing ruins a day faster than stepping onto a wad of gum on the street, and Anna Bullis has decided to do something about it. 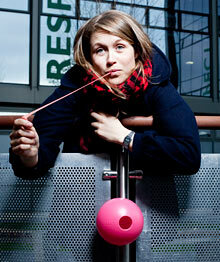 Bullis spent nearly a year working in a lab to discover some way to recycle used chewing gum, The Guardian explains. After putting wads of used gum through a number of chemical changes, Bullis was able to extract a polymer named, appropriately, Bullis Recycled Gum Polymer or BRGP. She then turned this substance into a plastic material to make pink bubble bins. Bullis intends for these bins to collect used gum. When they are full, both the bin and its contents can be recycled again. Whether there's a future in gum-turned-plastic depends heavily on how well Bullis markets her discovery to the manufacturers of green plastics, but a quick glance at all the plastic surrounding me as I write this proves the possibilities are virtually endless. What a brilliant idea. That is really cool! That Building Is Made of WHAT?